Conservatives in 1955 were restless, anxious to be heard, and had plenty of motivating issues. But they lacked political and intellectual leadership. That would soon come, with an outspoken Senator from Arizona and an articulate young author. The stage was set in the 1950s for the birth of a new conservative movement, as we see in this second excerpt from Chapter 4 (“1955: A Liberal Hegemony over America”) from America’s Right Turn: How Conservatives Used New and Alternative Media to Take Power, by Richard A. Viguerie and David Franke. We look at the books, magazines, newspapers, and organizations that paved the way for the future conservative movement. And the regional political spokesmen from both political parties who articulated the issues of the day. All that was needed was for this grassroots army of dissenters from liberalism to self-identify as a cohesive movement, with national spokesmen who had the charisma to turn these sparks of dissent into a blazing new movement. Two who had that ability were already becoming active, and would soon provide the needed leadership, but they could not have been successful without the groundwork provided by these publications, organizations, and politicians. So, the grumblers of the Right – the dissidents from liberalism – had their motivating issues. They were starting to recruit and convert people who could become a dedicated vanguard for a movement. But as of now, there was no encompassing movement for these people to attach themselves to. First there was a period of gestation – decentralized and somewhat anarchic, but highly creative, as only the future would show. Individual, grassroots conservatives honed their concerns through books, newspapers, and magazines, and then began to find an outlet in activist organizations. Books: Ideas have consequences, as Richard Weaver reminded us in his 1959 book by that title, and a surge of politically themed books almost always precedes political action. Many libertarian classics had appeared in the ’40s, among them Rose Wilder Lane’s Discovery of Freedom (1943), Henry Grady Weaver’s The Mainspring of Human Progress (1947), Friedrich Hayek’s enormously influential The Road to Serfdom (1944), and John T. Flynn’s The Roosevelt Myth (1948, with over 100,000 copies sold) and The Road Ahead (1949). More popular, with a far wider audience, were the acerbic writings of the Baltimore Sun’s H. L. Mencken. But the best-selling libertarian author, by far, was Ayn Rand, of The Fountainhead (1943) and Atlas Shrugged (soon to be published in 1957). Most conservatives consider Ayn Rand’s philosophical ideas to be, well, nutty, but her political novels have undoubtedly jolted more people out of their complacency, or converted them from some left-of-center ideology, than any other books – and many of those people ended up in the libertarian and conservative movements. Indeed, in a 1991 survey conducted by the Library of Congress and the Book of the Month Club, Atlas Shrugged was named the “second most influential book for Americans today” after the Bible. The problem, if you were a conservative or libertarian author who didn’t have the mass appeal of a Mencken or Rand, was that you had to settle for being published by an obscure house. The big Manhattan publishers had liberal attack dogs that sniffed deviant ideas and would tear up your manuscript the moment it arrived in the mailroom, lest it contaminate the place. Worthy libertarian titles were published by the likes of Caxton Press (Caldwell, Idaho), Devin-Adair (Manhattan, and later New Rochelle, New York), and The Bookmailer (operating from a post office box in Manhattan). Conservatives had a more vigorous, if unprofitable, publishing house with Henry Regnery’s firm in Chicago. The Great Books classics were a staple of the Regnery line, and Regnery himself introduced top contemporary European authors and politicians to an American audience. In the 1950s he became the main hope for conservative American authors, just as the firm bearing his name fills that role again today. Right up to our year of 1955, Regnery and other firms were publishing books now deemed to be conservative classics. These included William F. Buckley Jr.’s God and Man at Yale (1951), Whittaker Chambers’ Witness (1952), Russell Kirk’s The Conservative Mind (1953), James Burnham’s The Web of Subversion (1954), and McCarthy and His Enemies (1954), by William F. Buckley Jr. and L. Brent Bozell. Yes, a lot of book grumbling was going on. Magazines: Right-of-center periodicals, in 1955, were small and barely surviving. Yet they filled a necessary, even heroic role in creating underground networks of communication. The two most important periodicals were Human Events and The Freeman. Human Events at this time was a real Washington newsletter, not the tabloid it is today, and advertised itself as “A Weekly Analysis for the American Citizen.” In 1955 its 13,500 subscribers paid $10 a year, $11.50 for first-class delivery. Its editor was a crusty veteran reporter, Frank C. Hanighen, who had gained fame earlier as coauthor of Merchants of Death, the expose of the role played by arms merchants in the World War I era. Hanighen was well connected with Republican senators and congressmen on Capitol Hill, as well as with other reporters. Human Events’ publisher was a small-town newspaper owner, James L. Wick, who ironically had been a member of Governor Tom Dewey’s research staff in 1944. Wick kept the small-circulation letter afloat (barely) with fundraising appeals by the likes of actor Adolph Menjou. As opposed to Human Events, which was an inside-Washington newsletter, The Freeman was a lively opinion journal. It was also somewhat more libertarian than Human Events, though there was a lot of inbreeding between the two periodicals. Frank Chodorov, editor of The Freeman, was also a contributing editor at Human Events, and Frank Hanighen, editor of Human Events, also wrote a Washington column for The Freeman. Elsewhere, there were grass-roots publications like Kent and Phoebe Courtney’s Free Men Speak that were not as intellectually coherent as Human Events and The Freeman, but nevertheless important in building a following that could later be incorporated into the conservative movement. The American Mercury gave right-wing authors like Ralph de Toledano another venue; it was no longer Mencken’s revered journal, but it had not yet been bought and turned into an anti-Semitic voice. The libertarians had two religiously oriented publications, Faith and Freedom and Christian Economics, demonstrating that there is no necessary antagonism between libertarianism and religion, despite Ayn Rand. As we’ve noted, Reader’s Digest was the Big Bertha of conservative publications, even though it was mostly nonpolitical in content. It may have performed its most valuable service, however, by introducing Friedrich Hayek and a condensed version of his Road to Serfdom to an American audience. Elsewhere, U.S. News editor David Lawrence wrote a conservative business-oriented column on its last page, and Newsweek had two conservative/libertarian columnists – Raymond Moley and Henry Hazlitt. Newspapers: We’ve mentioned that the big, influential, “respectable” newspapers were all liberal. The Chicago Tribune was the only conservative (at that time) paper with any real clout, and that only in its midwestern heartland. (The Tribune’s iconoclastic publisher, Colonel Robert McCormick, died in our year of 1955. After his death, the great paper declined in influence, then in its conservatism.) The Philadelphia Evening Bulletin, the Houston Chronicle, and other out-of-Washington-and-New-York papers had conservative editorial pages but little clout nationally. Some of the most interesting writings were found in smaller papers such as William Loeb’s Manchester (New Hampshire) Union-Leader, a bane to pro-tax liberal politicians in election years; the Richmond News-Leader, with James Jackson Kilpatrick writing its highly literate editorials; and the nobody’s-more-libertarian-than-us Freedom Newspapers, published by R. C. Hoiles. Robert LeFevre, editor of that chain’s Colorado Springs Gazette-Telegraph, was also a colorful and articulate libertarian activist who ran the anarchist/libertarian Rampart College and Freedom School in the foothills of the Rockies. Organizations: At the grass-roots level, a number of conservative and anti-communist organizations would flourish for a while, then wither away when their overworked founders were no longer able to keep them afloat. They never turned into a coherent movement. Some of the groups making news in conservative and libertarian periodicals in 1955 were For America, Pro-America, the Committee for Constitutional Government, the American Good Government Society, We the People!, and grassroots actvisits Kent and Phoebe Courtney’s New Party, which in the end didn’t become a new party. Educational groups also abounded, among them Facts Forum, John T. Flynn’s America’s Future, and the Manion Forum. Operations such as these produced a steady torrent of literature. The American Legion was powerful at this time, and took hard anti-communist positions, as you would expect. There was even a conservative-oriented professional organization, the American Bar Association – no longer! In 1955 its past president, Frank E. Holman, was an ardent supporter of the Bricker Amendment, which was designed to protect U.S. sovereignty against UN and other treaties. Also, the January 29, 1955, issue of Human Events noted the formation of a future giant in the conservative movement, the National Right-to-Work Committee. Libertarian organizations tended to be more educational or academic than activist. The Mont Pelerin Society, founded in 1947, brought together the top free-market economists and political scientists from around the world. The Foundation for Economic Education (FEE), in Irvington-on-Hudson, New York, produced a steady stream of pamphlets and articles, and later assumed publication of The Freeman. FEE’s publications and debate kits were valuable resources for students of this era seeking an alternative to the prevalent statist fare served them at school. The educational organization that probably had the greatest influence on the conservative movement was the Intercollegiate Society of Individualists (ISI), founded by Frank Chodorov following an article he wrote in Human Events, proposing such an effort. ISI was educational, not activist, but it gave hundreds of future activists a firm grounding in conservative and libertarian philosophy. Robert A. Taft, the Republican senator from Ohio, had been the favorite of both conservatives and libertarians of this era, but he died some months before our year of 1955. Wisconsin’s Senator Joe McCarthy was still alive, but after his censure in December 1954 his influence (and sobriety) waned significantly. The removal of these two men left a void, and a new political movement needs at least one elected spokesman to give it visibility and recognition. Two Utah politicians were outspoken conservatives: Governor J. Bracken Lee and Eisenhower’s secretary of agriculture Ezra Taft Benson. Neither managed to become a national movement spokesman, however. Former president Herbert Hoover was a regular on some dinner circuits. Some conservatives adored him, others considered him an ineffectual has-been, and the libertarians considered him the first New Dealer. At any rate, he wasn’t of the age or temperament to lead a new movement. The U.S. Senate held some powerful and articulate Southern Democrats – Harry S. Byrd of Virginia, Walter F. George and Richard B. Russell of Georgia, and South Carolina’s Strom Thurmond, who had been the Dixiecrat candidate for president in 1948 and who in 1954 became the first person in U.S. history to be elected to a major office by write-in ballot. None of them had any hope of national leadership in the liberal Democratic Party, though, and it was hard to imagine them leading a national movement, most of whose members outside the South were Republican. Some conservatives in the pages of Human Events were advocating a political realignment of the parties, but that’s an even more difficult change than starting an effective new party. That left a band of powerful conservative Republicans in the U.S. Senate – Minority Leader William Knowland of California (also known as “the senator from Formosa,” for his ardent support of the Republic of China); Styles Bridges of New Hampshire, chairman of the Republican Policy Committee; and Ohio’s John W. Bricker of Bricker Amendment fame, chairman of the Committee of Committees. They performed valuable services for conservatives on Capitol Hill, but they were not willing to speak out publicly against the liberal leader of their party, Dwight David Eisenhower, except in the most modulated tones (and usually behind closed doors). That’s not the way to become a movement leader, even assuming you want to become one. 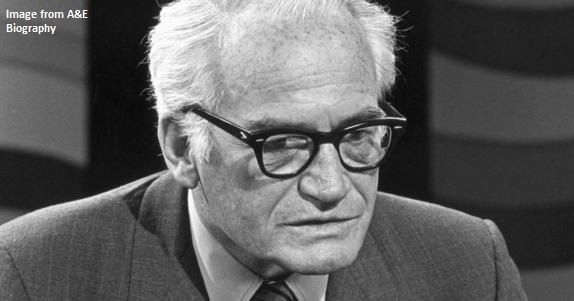 Oh yes, there was one young fellow, new to town – one Barry Goldwater of Arizona, head of the Republican Senatorial Campaign Committee. Unusually blunt and honest for a politician, he would soon be blasting Eisenhower’s programs – publicly! – as a “dime store New Deal.” The rest, as they say, would be history. For now, though, there was no overriding need for a national political spokesman because there was no movement for him to lead. Before our assortment of conservatives and libertarians could think of themselves as a distinct political movement, they had to have a center of gravity, some focal point, that addressed them as members of a movement and taught them, in Lenin’s words, what must be done. That giant step was taken in November of our year of 1955 with the founding of National Review magazine, edited by the charismatic young William F. Buckley Jr.